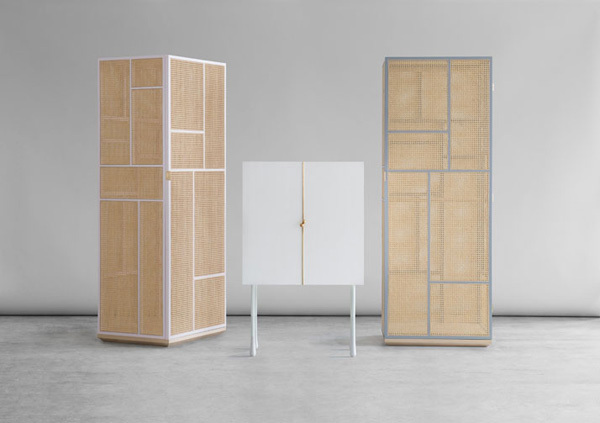 This furniture collection, inspired by the design features of handbags, is a collaboration between designer Mathieu Gustafsson and cabinet maker Nikias Karlsson of Grand. The brass ball clasp detail on the doors was inspired by the clasp mechanisms used on vintage handbags. The collection also draws inspiration from a classic rattan handbag by Swedish travel accessories brand Palmgrens. Launched at the Stockholm Furniture Fair in February, the collection will be exhibited at the Ventura Lambrate show in Milan's Salone del Mobile next month.